Boeing and Ethiopian Airlines celebrated the delivery of the carrier’s first Boeing 787-9 Oct. 27, 2017. Ethiopian is leasing the Dreamliner through an agreement with AerCap. 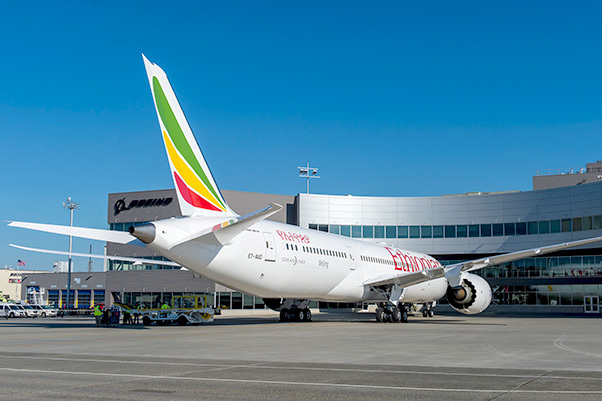 Ethiopian’s newest 787 touched down in Addis Ababa, Ethiopia, following a non-stop 8,354 mile (13,444 km) delivery flight from Boeing’s Everett, Wash., facility. Ethiopian becomes the first carrier in Africa to operate the 787-9 and extends a tradition of setting aviation milestones. 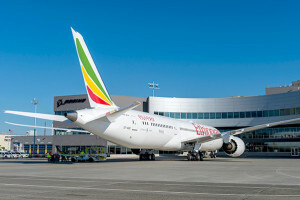 Ethiopian became Africa’s first carrier to fly the 787-8 in 2012, and similarly introduced the 777-200LR (Longer Range), 777-300ER (Extended Range) and 777 Freighter.